At long last I’ve discovered the secret of how to give a totally stress free dinner party. Invite house guests who love to cook and want to cook for you and lots of your friends as a thank you for their stay. Bliss! My friend Camilla Plum from Copenhagen and her lovely daughter Asta stayed with us recently, Camilla is both a gardener and a cook, in fact a very well-known one and the author of very many successful cook books. She also presents TV programme and cooking shows both on growing and cooking food, a subject on which she is deeply knowledgeable. They live on a small farm about 35 acres called Fuglebjerggaard about an hour north of Copenhagen. It’s an oasis of chic and cool, but more importantly it is a glowing example of the variety and biodiversity that can be produced on a small acerage, with about 200 food crops, orchards, many heirloom varieties of barley for homemade beer and wheat to dry and grind for sourdough bread which is then baked in the woodburning oven. Blood Orange and Scallion Salad, Salmon with Chermoula, Date and Green Raisin Chutney, Neck of lamb with Fennel and Yoghurt, Roast Potato wedges with lots of bayleaves, Cherry Tomato and Roasted Red Pepper Salad and a big bowl of green salad, Basmati Rice with Almonds and lots of Dill, followed by Apricots with Ginger, Avocado Cream with Dried Rose Petals, Prunes with Tea and Vanilla, Danish Red Berry Compote with Jersey Cream…. The food looked fresh and beautiful and tasted so summery in the midst of our depressing winter weather. Try some of these recipes for yourself. California Wines Tasting in The Grainstore at Ballymaloe House on Wednesday March 9th at 7pm. Tickets for the event are €10 and in-cludes talk, wine tasting and canapés. In two roasting tins, mix the lamb chops with the chopped onion, garlic and spices. Marinate the lamb necks in the spices, lemon zest and enough olive oil to coat the meat. Sprinkle with two teaspoons of salt and cook uncovered in the preheated oven at 230°C/450°F/gas mark 8. Turn regularly to make sure the spices don’t burn. When the lamb necks are browned, approximately 30 minutes, dollop on half the yoghurt and add the quartered fennel bulbs. Mix it around until everything is coated with the yoghurt. The lamb necks can now fit into one deep roasting tin. Put about 300 ml/10 fl oz of water in the bottom of a deep roasting tin, add the lamb and fennel. Reduce the oven temperature to 170°C/325°F/gas mark 3. When the meat is cooked, about 2½ to 3 hours, remove the lamb and fennel to a serving dish and keep warm. Transfer all of the remaining juices into a pan, degrease and reduce a little if necessary. The sauce should be thickish. Taste and correct seasoning. . Bit by bit, stir in the rest of the yoghurt, pour over the lamb. Garnish the dish with toasted whole almonds, lots of fennel fronds, fresh mint and serve with fresh chard or spinach. Chermoula is a wonderfully versatile fresh herb and spicy sauce from Morocco and Tunisia. There are many versions, some include saffron but we love this one which Asta and Camilla Plum cooked for us recently. It’s fantastically versatile, we also slather it over a sptachcock chicken, a shoulder of lamb or even chicken breasts. It uses both the stalks and leaves of coriander. Arrange the fish in a roasting tin, cut deep slashes on each side of the fish. Whiz the ingredients for the chermoula to a fine paste in a food processor with 200 ml olive oil. Smother the fish in the mixture. Bake in a preheated oven at 160°C/325°F/gas mark 3 for about 1 hour 20 to 1 hour 30 minutes or until just cooked. Serve warm or at room temperature with green salad. Also gorgeous with chocolate cake or ice cream. Put the apricots in a saucepan, cover with cold water and leave to soak overnight. Next day, strain the apricots and put in a saucepan with the ginger, lemon peel, sugar, wine, cardamom and enough water to cover. Simmer gently with the saucepan lid on for at least an hour. Remove the lid and gently simmer until the liquid is reduced to a thick syrup, 5-10 minutes. Stir in the lemon juice and orange blossom water. Make sure you don’t break up the apricots while stirring. Garnish with sliced red chilli, if using. Eat with chocolate cake, ice cream or just whipped cream. A much loved Danish summer classic – this version is super delicious even though we made it with frozen berries. The amount of sugar will vary between a ¼ or ½ of the weight of the berries depending on the sourness. Put all the berries except the raspberries in a heavy bottomed saucepan with 2 cm (1 inch/30 ml) of water, on a high heat, for 3 minutes. Just before they burst, put two tablespoons of the compote into a little bowl, mix with the cornflour until there is a smooth paste. Whisk the paste back into the berries; continue to cook until the mixture thickens slightly, 1-2 minutes. 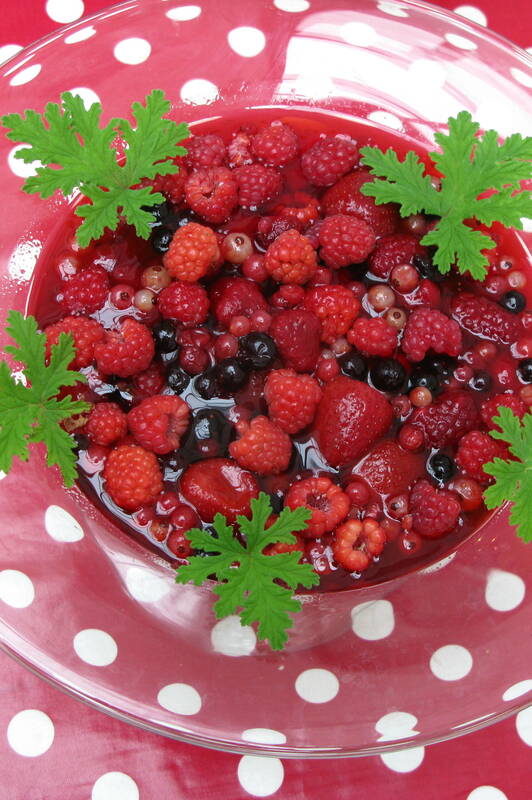 When the berries burst take them off the heat and stir in the sugar and fresh raspberries. Serve the compote warm in individual glasses or at room temperature with some Jersey cream and a scattering of whole blanched almonds. Another delicious winter dessert, a terrific stand by to keep in a kilner jar in the fridge. Cover the prunes with tea and allow to soak for several hours or better still overnight. Next day put everything into a saucepan and simmer uncovered for an hour or so. Make sure that the prunes are soft and tender and the liquid is reduced to thick syrup. Leftovers can be mixed with softly whipped cream to make an exquisite fool. This makes ¼ pint/5 fl oz of dressing. We used 2 fl oz. Remove the peel and pith of the oranges, slice 6 or 7 oranges thinly and seg-ment from the remainder. Mix the olive oil, salt, freshly ground black pepper, orange blossom water and cider vinegar in a bowl. Arrange the orange slices and segments in a big plate and drizzle the dressing over. Cut the spring onions into 5mm (1/4 inch) slices at an angle diagonally. Sprinkle over the salad with the pomegranate seeds, fresh fennel and mint leaves and diced fennel bulb. Toss gently. Olives, toasted almonds or coarsely chopped pistachio nuts would be a delicious addition. Lovely Mary Jo McMillin from Chicago came to the Ballymaloe Cookery School again recently – Mary Jo has been coming to Ireland for over 30 years. Her idea of a holiday from her restaurant in Oxford, Ohio was to come into the busy kitchen at Ballymaloe House for a couple of weeks each summer. We all had fun cooking together and learned lots and lots of good things from each other. In 2008, Mary Jo moved from Ohio to set up a new life near her children and grandchildren in Chicago. It was back to home-cooking and the challenge of making a whole new set of friends in her retirement. What to do? Her children’s friends were all sweet but much younger so Mary Jo joined a church choir brought along some delicious food plus tempting cakes and cookies which blew them all away – had she really cooked all these delicious things herself? Immediately, they’re were requests for big gratin dishes of lasagne, stews, casseroles, apple tarts and praline cakes so within a short time Mary Jo had a new bunch of friends and a thriving catering business. Her plans for retirement were cheerfully put on hold. Soon she was giving cooking classes in the local kitchen ware shop and that led to invitations to do private cooking classes in people’s houses. So many of the local community, no longer had cooking skills and were overjoyed to be able to learn gorgeous comforting family dishes in an informal environment. In many ways this is fast becoming a similar reality over here. So at her recent cooking class on a frosty winter’s day here at the Ballymaloe Cookery School she charmed the audience with a range of delicious comforting dishes and a long list of cooking tips gleaned over many years. Everyone wants to feed their babies nourishing and wholesome food but many young mothers are completely confused and bamboozled by endless conflicting advice. How and when do I start to offer solids….. Many of us lack the understanding to make our own baby food but as a mother of four and grandmother of ten, Darina Allen is happy to pass on the tips and advice gleaned over years of feeding children and grandchildren totally without packets, cans or jars! On Friday 26th February 2016, we will cover everything – choosing the ingredients, recipes, preparation tips, menus, storage, health and nutrition …. Not only will it save you a small fortune but it will be infinitely better for your baby. You’ll soon discover that making your own, nourishing baby food is quick, easy and surprisingly good fun. Also, by giving your baby lots of variety you’ll ensure that as they grow up they don’t become fussy eaters. If you need to bring a child minder with you they are very welcome to take a walk around our gardens free of charge while you are attending the course. This is an absolute gem of a recipe, a savoury bread and butter pudding which can utilise all kinds of tasty bits and pieces from your fridge in a totally delicious way. Mary Jo serves it for brunch but it would also make a delicious lunch or light supper dish with a salad of organic leaves. Melt the butter in a small heavy, sauté pan and sweat onion over a low heat. Add the chopped garlic to the top of the onion and cover with butter wrappers or a parchment circle. The onion and garlic should not brown but will lightly colour, melt into softness and reduce by half. Allow 20-30 minutes to cook the onion. Combine the cooked onion, garlic, drained, squeezed and chopped spinach, sautéed mushrooms, cooked sausage, parsley and thyme. Season the mixture with salt and pepper. The vegetable/sausage mixture should weigh at least 1.1kg (2 1/2 lbs). Beat the eggs in a large bowl; add the cream, milk and season well with salt, pepper, freshly grated nutmeg and a pinch of cayenne. Generously butter a 39 cm x 27 cm x 6 cm oval baking dish or two 21cm x 21cm x 6cm square baking dishes. Pour half of the egg milk mixture over the diced bread. Spread half of the moistened bread with a slotted spoon and spread it over the bottom of the baking dish. Distribute 2/3 of the vegetable mix over the bread and top with 2/3 of the grated cheese. Add the second half of the moistened bread over the vegetables and sausage. Pat everything firmly in place with your clean hands. Pour the remaining milk and egg mixture evenly over the casserole and sprinkle over the remaining cheese. Cover with cling film and refrigerate overnight. Remove from the fridge an hour before cooking if possible. Bake the Strata in a 190°C/375°F/Gas Mark 5 oven for 45-50 minutes or until puffed and golden. Allow to rest at room temperature 15 minutes before cutting. Pull off as much skin as possible from the chicken, trim any excess fat, pat dry with paper towels, and season with salt. Cover and refrigerate overnight or leave 1/2 hour at room temperature. Heat 3 tablespoons (4 American tablespoons) oil (or 1 1/2 tablespoons/2 American tablespoons each butter and oil) in an enamelled casserole or heavy stewing pot; add the whole spices and sliced onion. Sauté gently for 30-40 minutes or until the onions have reduced to a deep golden brown. Meanwhile, prepare the crushed “green spices” and measure all the dry spices into a small cup. Plan to grind 1 chilli with the ginger and garlic; cook the other chilli whole in the curry and remove when the sauce reaches desired point of heat. To grind the green spices in a mortar, begin with one sliced chilli and a pinch of salt. When the chilli is mashed to a paste, add 1/2 the ginger and another pinch of salt. Continue with the remaining ginger, and finally add the garlic. Crush thoroughly, pounding and grinding against the stone to produce 75g (3oz/1/2 cup) ginger mash. To grind the green spices in a blender, place chopped ginger, garlic and chilli in a blender jar; add 50ml (2fl oz/1/4 cup) of water and pulse to a smooth puree. When the onions have reduced and browned, add the ginger mash and continue to sauté, stirring constantly, until seasonings smell cooked and any water has evaporated. Sprinkle in the mixed dry spices and continue stirring until the mixture is delightfully fragrant. At this point the seasoning base will have reduced to a dark lump smaller than a baseball. Gradually blend in the chopped tomatoes, tomato paste and water. Add 1 whole chilli if desired. Simmer the sauce, covered for 30 minutes. Meanwhile, lightly brown the chicken pieces in 3/4 tablespoon (1 American tablespoon) oil and add to the sauce in the casserole. Pour the fat off from the frying pan, deglaze with water and add to the curry. Take care to place dark meat on the bottom and breast pieces on top, since white meat will cook faster and will need to be removed before the dark meat is ready. (This step is optional. Many cooks add raw chicken to the prepared curry sauce for cooking; however, the effort of browning will add depth of flavour to the finished dish.) Cover and bake in moderate oven, or simmer on the stovetop. Breast meat will be ready in 20-30 minutes; dark meat will take 45-50 minutes. When the chicken is tender, skim excess fat if necessary and taste sauce for seasoning, adding fresh lemon or lime juice and a generous amount of chopped coriander (cilantro). Note: For a typical variation, simmer 1 large peeled, diced potato along with chicken, and just before serving, sprinkle in 130g (4 3/4oz/1 cup) frozen peas. Store in an airtight jar and use within a couple of weeks. Roast the spices in a dry iron skillet until fragrant. Cool slightly and grind to a powder in a spice grinder, sift and store in a small jar with a tight fitting lid. Top Tip: To clean a spice grinder, add a handful of white rice, grind and discard the rice. Do not try to wash a spice grinder. An electric coffee mill makes an excellent spice grinder. Peel the cucumber, scrape out the seeds with a teaspoon. (Leave the centre intact if using seedless cucumber.) Cut into small dice. Place the diced cucumber in a bowl; toss with salt and allow to stand 20-30 minutes. Rinse lightly under water; shake dry in a sieve, then place drained cucumber in a tea towel and twist to squeeze out most of water. Squeezed cucumber will be crisp, transparent and half its original volume. Mix the garlic, onion, herbs and optional chilli into the yogurt. Fold in the cucumber. Season to taste with salt and pepper. Place in a serving bowl and dust the top with ground cumin. Garnish with more coriander (cilantro) and optional tomato. This recipe was also a revelation; the rice is cooked in water rather than stock and had a rich and complex flavour because of all the additions. Mary Jo serves it as an accompaniment to the chicken masala but I would also enjoy it as a vegetarian dish on its own with a nice dollop of raita. In a 5 litre heavy saucepan with a tight fitting lid, heat the cinnamon and coriander in butter and oil until fragrant. Add the onion and sauté covered with butter wrappers or parchment until tender. Add the carrots, spices and sauté until fragrant. Stir in the rice and salt to coat with the spiced base. Add water and cooked lentils. Stir, cover and cook for about 15 minutes or until all the water is absorbed. Allow to stand for 15 minutes before fluffing with a fork. Mary Jo showed us such a brilliant technique to make a stunningly professional looking French Apple Tart – there’s no sugar in the pastry because the tart will be cooked at a high temperature. The pastry quantity below is enough to make three tarts. Left over pastry can be frozen for another time. To make pastry in food processor: place the flour and salt in a bowl. Add the cold butter and lard and cut in 1/2-inch cubes or slices. Pulse 3 times to break up the butter into flakes. With the processor running, pour in the ice water in a slow stream through the feed tube. Stop the processor as soon as the pastry rolls into a ball. Remove the ball of dough from the bowl; shape into 15cm (6 inch) log. Wrap in plastic and refrigerate (makes scant 2lbs/30oz pie crust). To roll a shell: shape 300g (10oz) chilled pastry (one-third of batch) into a 10cm (4 inch) disk. Dust with flour and roll on a smooth, clean surface, giving the dough a quarter turn with each rolling to maintain a circle. Roll to a generous 33cm (12 inch) circle; brush off any excess flour. Fold in quarters; unfold onto the inside of the quiche tin. Press the pastry firmly into bottom edge of the tin. Use a scissors to trim the dough to an even 1cm (1/2 inch) overhang. Tuck the overhang inside the pastry edge, pressing firmly. Crimp or flute the top edge. Chill the pastry shell for at least 30 minutes before baking. Chilling relaxes the gluten in the flour and prevents shrinkage and cracking. In haste, the tart shell may be chilled in the freezer for 10 minutes. Next prepare the apples. Peel the apples, swivel out the stem and blossom the ends with a paring knife, cut in half, and remove the cores with a teaspoon or melon baller. Place the apple halves cut-side down on wooden board. Cut a thin slice from both the stem and blossom ends. Coarsely chop cut-off the slices and set aside. Hold each apple half between the thumb and first finger; cut halves into 8 – 9 x 5mm (1/4 inch) slices. Cut through but keep the slices together. Preheat oven to 220ºC/425°F/Gas Mark 7. Dust the chilled pastry shell bottom with flour. Sprinkle over the chopped apple bits. Place the sliced apple halves snugly around the tart shell and in the center. Cut any leftover slices in half and tuck into any spaces. Sprinkle the apples with sugar and dot with butter. Bake the tart in the preheated oven for 45-50 minutes or until the pastry is richly colored and the apples are brown-tinged and tender. Remove the tart from the oven and use the back of a spoon to carefully fan the cooked apple slices into a circle. Brush or spoon over the warm apricot glaze while tart is hot (see recipe below). Cool on wire rack. Note: To prepare apricot glaze, simmer the apricot jam until it has consistency of melted jelly. If jam has chunks of fruit, it will need to be strained. If jam is too sweet, sharpen with lemon juice. Not sure how many Valentine’s Day articles I’ve written but I’m an incurable romantic so here we go again. While the teenagers and 20 something’s are all testosterone charged and a dither, each and everyone of us need to keep romance alive in our everyday lives and it’s so worth the little effort it takes, yes little….it could be – your last Rolo or some teenie treat that our dear one loves. A little tiny unexpected surprise can make your heart skip because it’s meant to. I don’t know any ‘lady’ of any age who isn’t charmed by a bunch of flowers or even a little cyclamen or polyanthus, particularly when it comes out of the blue. Of course Valentine’s Day is associated with roses but how predictable is that and there are another 364 days in the year when you may well get an even more delighted reaction and set their heart a flutter. Remember it doesn’t have to be a special occasion to come up with a little surprise which says “hey- thought you’d love them so I picked it up specially for you”. If you are hell bent on bringing on a proposal then you might want to take to the kitchen – the way to everyone’s heart and all that. Nothing quite like gorgeous cooking smells for someone to visualise their life stretching out ahead of them and how enticing it would be come home to those aromas every evening!! Well now if are moved to rattle the pots and pans – one could of course cook an entire supper or a candlelit dinner but here are recipes for a few thoroughly unsubtle heart shaped creations. The hottest food trend at present also happens to be my favourite way to eat. I often find myself ordering a selection of starters instead of an entrée or main course. This enduring trend coincides with our love affair with snacking and allows the diner to mix and match as they please. An appetiser can be a starter; a trio of little plates can make up a meal and provide the opportunity to try lots of dishes on the menu, something new and tempting, or even something scary that one may not have ordered before. Small plates are also perfect for those who may have a concern about the price point without the potential of a wallet busting experience. First remove the wish bone from the neck end of the chicken, this is easily done by lifting back the loose neck, skin and cutting around the wish bone with a small knife – tug to remove, this isn’t at all essential but it does make carving much easier later on. Tuck the wing tips underneath the chicken to make a neat shape. Put the wish bone, giblets, carrot, onions, celery and herbs into a saucepan. Cover with cold water, bring to the boil, skin and simmer gently while the chicken is roasting. This is the basis of the gravy. Next make the stuffing, sweat the onions gently in the butter in a covered saucepan until soft, 10 minutes approx. then stir in the white bread crumbs, the freshly chopped herbs, a little salt and pepper to taste. Allow it to get quite cold unless you are going to cook the chicken immediately. If necessary wash and dry the cavity of the bird, then season and half fill with stuffing. Season the breast and legs, smear with a little soft butter. Preheat the oven to 180°C/350°F/Gas Mark 4. Weight the chicken and allow about 20 minutes to the lb and 20 minutes over – put on middle shelf in oven. Baste a couple of times during the cooking with the buttery juices. The chicken is done when the juices are running clear. To make the gravy, tilt the roasting tin to one corner and spoon off the surplus fat from the juices and return the roasting pan to the stove. De-glaze the pan juices with the fat free stock from the giblets and bones (you will need 1-1 1/2 pints depending on the size of the chicken). Using a whisk, stir and scrape well to dissolve the caramelized meat juices in the roasting pan. Boil it up well, season and thicken with a little roux if you like (the gravy should not be thick). Taste and correct seasoning, serve in a hot gravy boat. If possible serve the chicken on a nice carving dish surrounded by crispy roast potatoes and some sprigs of flat parsley then arm yourself with a sharp knife and bring it to the table. Carve as best you can and ignore rude remarks if you are still practicing but do try to organise it so that each person gets some brown and some white meat. Serve with gravy and bread sauce. There are two kinds of roast potatoes – those cooked on their own and those cooked around the joint of meat. The latter cook more slowly, don’t look quite so perfect but have a delicious soggy bottom rich with the flavour of the roast meat juices. Peel the potatoes, if they are enormous cut in half or quarters, – don’t attempt to wash or worse still soak them in water or they will be wet and soapy when cooked. If you must prepare them ahead then put them into a bowl lined with damp kitchen paper. Cover the top with more wet paper and store in the fridge, they will keep perfectly well this way for several hours. Dry well otherwise they will stick to the tin and you’ll loose the lovely crusty bit on the base. Tuck the potatoes around the roast in the roasting tin, toss them in the rendered fat, sprinkle with salt, baste and turn occasionally as they cook – they will take about an hour depending on the size. Cook lots and serve very hot. Chocolate puddings run neck and neck with apple tarts as people’s favourite dessert. This one is wickedly rich with a melting texture. It should be moist in the centre, so don’t overcook or it or it will be dull. It is also good cold. Cut up the chocolate into small pieces and melt with the butter in a very low oven or in a Pyrex bowl over hot but not simmering water. As soon as the chocolate has melted, remove from the heat and add the pure vanilla extract, then stir in the warm water and the castor sugar. Continue to mix until the mixture is smooth. Separate the eggs, whisk the yolks into the chocolate mixture, then fold in the sieved flour making sure there are no lumps. Whisk the egg whites in a clean bowl with a pinch of cream of tartar until it reaches stiff peaks; fold gently into the chocolate mixture and pour into the greased pie dish. should be firm on top but still soft and fudgy underneath. Cool a little and dredge with icing sugar. Serve warm or cold with softly whipped cream or crème fraiche. *Individual dishes take 8-12 minutes (depending on the size of the ramekins) approx. at 200°C/400°F/Gas Mark 6. Chocolate fudge pudding is also delicious cooked in a Kilner Jar (7.5cm/3 inches diameter) – cook in a preheated oven at 200°C/400°F/Gas Mark 6 for 12 minutes. Everyone’s favourite pudding – the pastry is made by the creaming method, so people who suffer from ‘hot hands’ don’t have to worry about rubbing in the butter. First make the pastry. Cream the butter and sugar together by hand or in a food mixer. Add the eggs and beat for several minutes. Reduce the speed and mix in the flour. This pastry needs to be chilled for at least 1 hour otherwise it is difficult to handle. To make the tart, first roll out the pastry to about 3mm (1/8in) thick and use about two-thirds of it to line your tin. Peel, quarter and slice the apples into the tart. Sprinkle with sugar and add the cloves. Cover with a lid of the remaining pastry, seal the edges and decorate with pastry leaves. Brush with egg wash and bake in the oven until the apples are tender, about 45 minutes to 1 hour. When cooked cut into squares, sprinkle lightly with caster sugar and serve with softly whipped cream and Barbados sugar. The Chinese celebrate their New Year on February 8th 2016, the second new moon after solstice. The festivities to welcome in The Year of the Monkey take place all over the world with the biggest celebrations outside Asia taking place in London where there are parades, traditional lion and unicorn dances, music, fireworks and lots of fun. The feasting and excitement will continue onto the Lantern Festival – the 15th Day of the New Year. Each Chinese New Year is characterised by one of the 12 animals which appear in the Chinese Zodiac. The next year of the Monkey won’t be until 2028. Chinese families gather together to celebrate the most important festivals of the year similar to Christmas for Westerners. Back in 1984, one of the very first guest chefs I invited to the Ballymaloe Cookery School was Deh ta Hsiung, a Chinese chef living in the UK. Both he and his food were a smash hit. Up to then I knew virtually nothing about Chinese food nor did I have any proper equipment so a few weeks before the course, we met in London and he and I went shopping in China town for woks, cleavers, spiders, ‘wood ears’ and all kinds of ‘strange’ and unfamiliar ingredients and implements. We had such fun and I had a crash course in all things Chinese including chicken feet for lunch which I loved much to Deh ta’s amazement. In fact, the owner of the restaurant gave us a free lunch ‘cos he said I was the first Westerner ever to order chicken feet in his restaurant. Here in Ireland we have a flourishing Chinese community and a long tradition and affection for Chinese restaurants and an ever increasing trade with China. So let’s all celebrate together and try to cook some Chinese at home. Here are a few of my favourite recipes that are easy to rustle up at home. Deh ta Hsiung wrote 19 cookbooks including Chinese Cookery for Marks and Spencers in 1983. His books are a brilliant introduction to Chinese food, his recipes really work and are authentic and delicious. 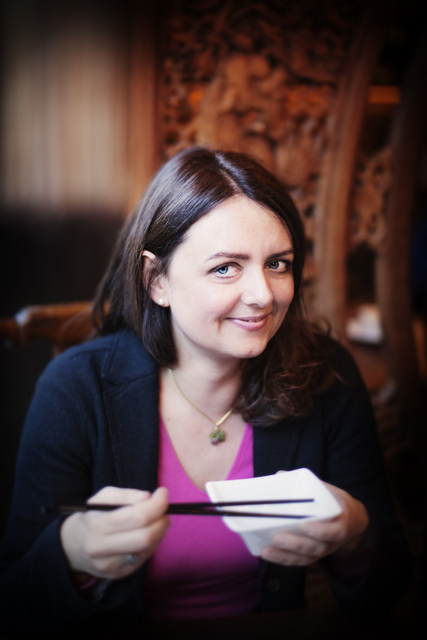 Fuchsia Dunlop’s Every Grain of Rice: Simple Chinese Home Cooking, published by Bloomsbury Publishing, is also worth seeking out. Slash the skin 2-3 times on each thigh and arrange the chicken thighs in a single layer on a large roasting tin. Mix together the hoisin sauce, sesame oil, honey, five-spice powder, ginger, garlic and some salt and pepper. Pour over the chicken and toss to coat – allow to marinate for 2 hours, or overnight if you have time. Roast in the preheated oven, skin-side up for 35 minutes, basting as least once during cooking. Sprinkle with toasted cashew nuts and spring onions. Serve with rice. Bok Cho, Pak Cho and Tat Soi are all fairly delicate in flavour and full of moisture so they take and benefit from and take on extra flavours readily. Divide the leaves, wash, drain, then chop both the stalk and leaf in 2 – 2.5cm (3/4 – 1 inch) pieces. Heat a little extra virgin olive oil or sunflower oil in a wok or wide saucepan over a high heat, add the grated ginger and chilli. Toss in the bok choi. Season with salt and freshly ground black pepper, toss and cover for a few minutes, toss again, when almost tender add the chopped herbs or other flavourings. Lay the cucumber on a chopping board and smack it hard a few times with the flat blade of a Chinese cleaver or with a rolling pin – this will loosen its flesh and make it more easily absorb the flavours of the sauce. Then cut the cucumber, lengthwise, into four pieces. Hold your knife at an angle to the chopping board and cut the cucumber on the diagonal into 1/2 – 1 cm (1/4 – 1/2 inch) slices. Place in a bowl with the salt, mix well and set aside for about ten minutes. Combine the other ingredients in a small bowl. Drain the cucumber, pour over the sauce, stir well and serve immediately. It’s such fun to make Chinese fortune cookies, each one has a strip of paper hidden inside with Chinese wish proverb. They are made from a simple tuile batter. Spread them really thinly and mould as soon as they come out of the oven otherwise they become brittle and crumbly. Have your little wishes ready to pop in. Melt the butter gently and allow to cool a little. Put the egg whites and sugar into a spotlessly clean bowl and whisk for a few seconds. Fold in the flour and mix. Add the melted butter, cream and almond extract. Mix until well combined. Spoon 1 teaspoon of batter onto a prepared baking sheet, spread with the back of a spoon into a thin even 4 inch (10 cm) round. Allow room for spreading and don’t attempt to cook more than 3 or 4 at a time, otherwise it will be difficult to shape them quickly enough. Bake until the edges of the cookies turn golden brown, 6-8 minutes.